Often there is the sound of talk from the women as they quilt. It is good talk – the kind that is easy to listen to and to think about. Sometimes though everyone just sews and there is a pause in the conversation. Then the room becomes quiet. Although not entirely quiet as you can hear the thread pulled through the cloth. Each stitch goes through three layers: the pieced top, the batting and the bottom. Then the needle comes up through these three. You can hear the thread as it is pulled through. Some fabrics are more resistant than others. After some time the conversation begins again. Or perhaps a visitor comes into the old school house. You might think that a group of women quilting would be a rather dull setting for five hours on Fridays. But there are a surprising number of visitors. A women brings in her son to show him the quilt we are working on for their family. A volunteer who does photography for the Historic Village stops by to drop off some pictures. Members of the Board of History come in to talk about various business items. How will we raise enough money to repair the roofs on two buildings? Last week was Lynda’s birthday. Catheryn ordered pizza and had it delivered. What a treat it was to have the pizza delivery person come through the door with her boxes at noon! We immediately took off thimbles, laid down needles and thread and got out plates and napkins. It was a lovely time with all sorts of homemade cookies and sparkling cider to complement the pizza. But as usual, within a half hour everyone tidied up from the birthday celebration and went back to quilting. Joan told me that I should have a photo of the exterior of the old school house. 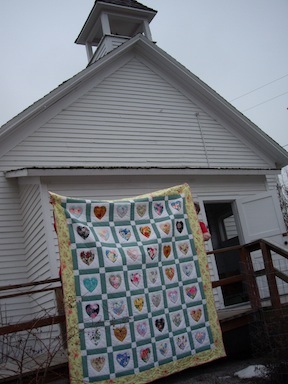 When some of the women took a finished quilt outside, it was the ideal time to capture the building and our work.